The Relaxation oscillator consist of UJT(uni junction transistor), capacitor, two base Resistors and a variable Resistor(POT) . The fig shows the circuit diagram of UJT RELAXATION OSCILLATOR. 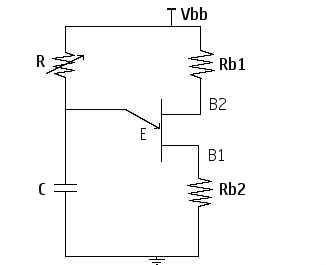 It is commonly used to produce Triggering (Gate) signals for SCR to turn it ON. When the supply voltage Vbb is given, the Capacitor C will charge exponentially to a peak value Vp. At the point Vp the Emitter triggers and TURN the ujt ON, until this point ; the emitter is isolated(doesnt conduct) from the transistor so no Current Conduction occurs between Base1 and Base2. The charging of capacitor is determined by the time constant RC, because the capacitor is charging through the resistor R.
After getting the UJT turned on the Capacitor discharges through the base resistor,Rb2 to the valley point. This charging and Discharging of the Capacitor is the output Voltage. And it is used as gate Pulse to trigger SCR's. figure shows the waveform of Capacitor charging and discharging.